Sprouted seeds have been grown and consumed since before recorded history. They are a fast-growing, fresh vegetable especially welcome during the cold, dark days of winter which prohibit outdoor cultivation. 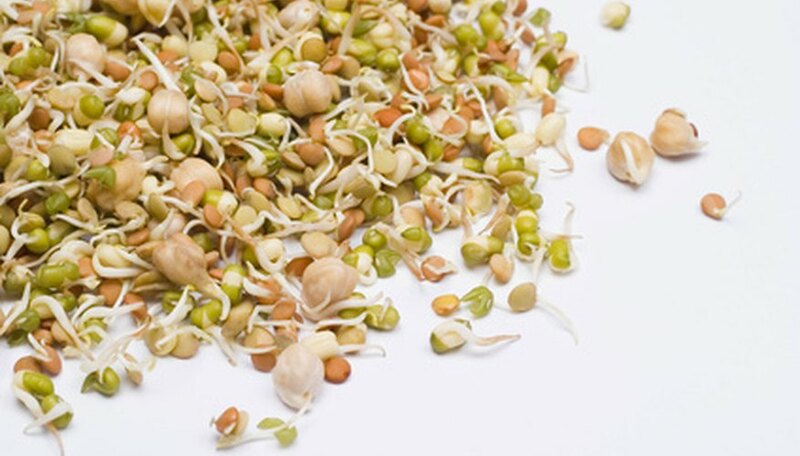 Although mung bean and alfalfa are by far the most popular sprouts, many different varieties and types of vegetables and grains are suitable for sprouting, according to Larry Bass and Douglas C. Sanders, Extension Horticultural Specialists at North Carolina State University Extension Service. The most common sprout is perhaps the mung bean. It has been sprouted as a food source since ancient times. Mung bean sprouts are large and meaty; they stand up well to cooking in stir fries and soups. They are sometimes canned and are available in Asian food stores. Another bean commonly sprouted is the adzuki. Native to Asia, its flavor is sweet and nutty and it is often mixed with sugar and used to make sweet confections in Asian cuisine. Cabbage, fenugreek, mustard greens, radish and sunflowers are all vegetables which easily produce flavorful sprouts. Sprouts of radishes and mustard greens are peppery and make an excellent addition to salad. Cabbage and fenugreek produce sprouts that taste very much like their mature “fruits,” while sprouts of sunflower seeds are nutty tasting. Wheat sprouts have a malty flavor and are in fact the source of malt powder added to ice cream drinks to change them from “shakes” to “malts.” Rye, alfalfa and triticale all produce smallish sprouts that are excellent on sandwiches; alfalfa sprouts are commonly available at supermarkets across the United States and have been popular for decades. Sprouted seeds of chickpeas, lentils and green peas have a subtle, buttery taste. Because of their larger size, they work well in stir fries, soups and casseroles.